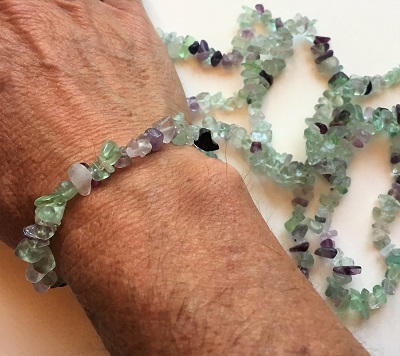 Stunning rainbow Fluorite crystal chip bracelet strung on 6 inch elastic cord with a beautiful colorful blend of purples, blues, and greens. Fluorite is highly protective stone, especially on the psychic level. Fluorite draws off negative energies and stress of all kinds. Fluorite helps you discern when outside influences are at work within yourself and shuts off psychic manipulation and undue mental influence. Fluorite cleanses and stabilizes the aura. Fluorite grounds and integrates spiritual energies and heightens intuitive power. Fluorite also helps to dissolve illusions and reveal the truth. Fluorite helps you absorb new information and promotes quick thinking. 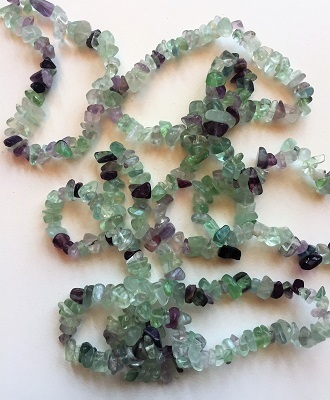 In healing, Fluorite may benefit teeth, cells, bones, and repairs DNA damage. Dissolving adhesion and mobilizing joints, Fluorite may be helpful to alleviate arthritis, rheumatism, and spinal injuries. Fluorite provides pain relief, ameliorates the discomfort of shingles and other nerve-related pain. 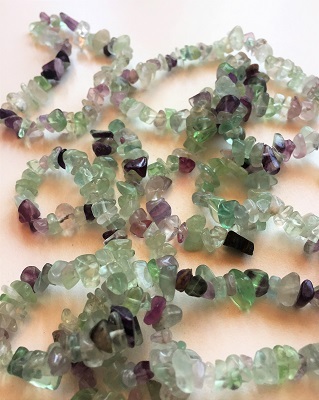 Fluorite helps to heal the skin, removes blemishes and wrinkles.